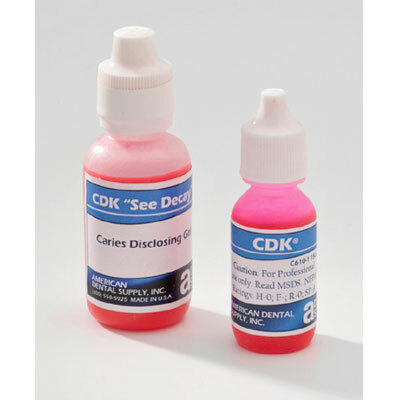 CDK | American Dental Supply, Inc.
CDK is formulated in 2 high-visibility colors: CDK Red is pink and stained tissue can be easily seen; CDK Green provides contrast if the field contains blood. CDK has been clinically proven to detect outer and inner carious dentin and differentiate them from noninfected tissue.1 CDK is formulated in a nontoxic modality with ideal viscosity for intraoral placement. 1. Boston DW, Jeffries SR, Gaughan JP. The Relative Location of the Dye Staining Endpoint Indicated With Polypropylene Glycol-Based Caries Dye versus Conventional Propylene Glycol-Based Caries Dye. Eur J Dent. 2008;2:29-36.